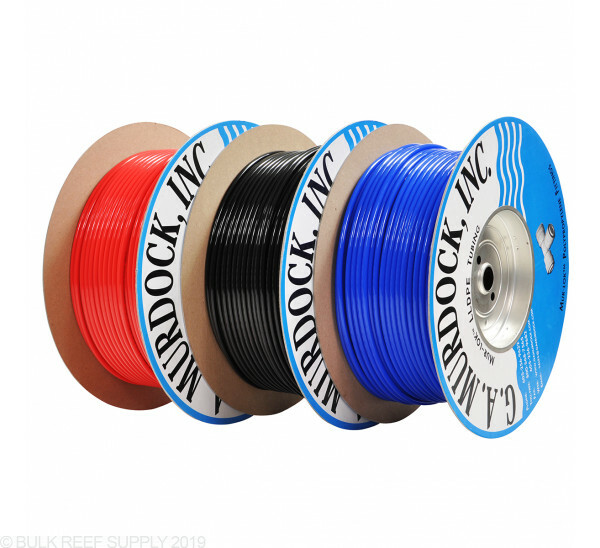 Made in the USA, Mur-lok Linear Low Density Polyethylene (LLDPE) tubing is designed for use with all Mur-lok and John Guest push connect fittings. Mur-lok polyethylene tubing offers excellent pressure and temperature ratings and has outstanding resistance to environmental stress cracking, surpassing 1000 hours of ASTM D1693 (10% IGEPAL testing). The tubing is BPA-Free, FDA approved materials and is NSF Standard 58 Certified. The Mur-lok LLDPE Tubing is NSF 58 Component Certified. The products were put through rigorous structural and material testing to help ensure they meet the standards for drinking water. This certification also ensures that our Mur-lok tubing can be easily incorporated into any NSF certified drinking water system with minimal paperwork and minimal, if any, re-testing. 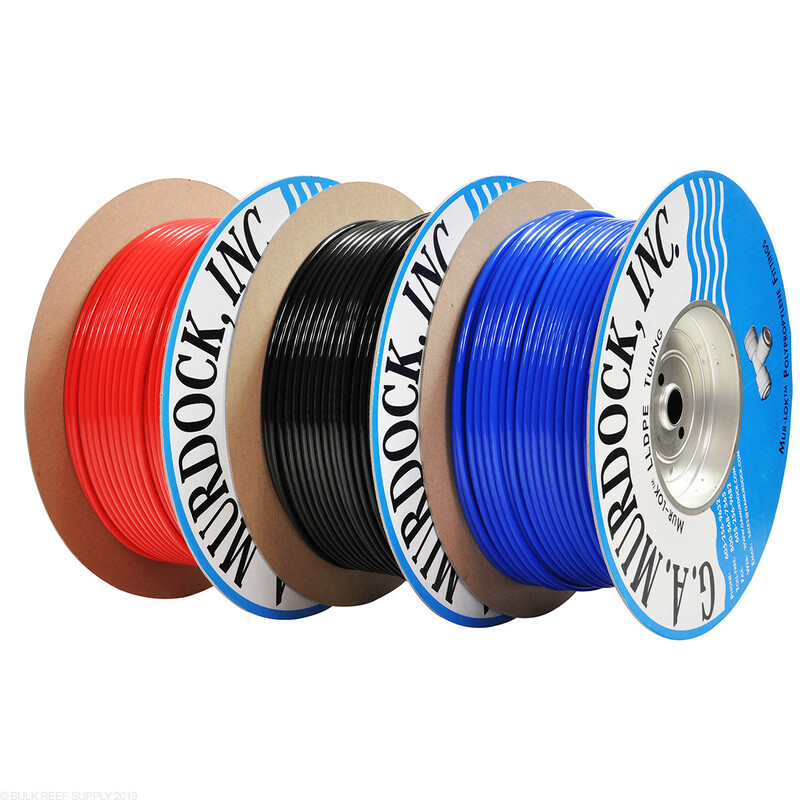 High quality and the best tubing you can buy without a doubt. I use it for my reactors and all of my dosing pumps! I purchased 10 feet of the blue tubing so that my RO/DI unit could reach my water receptacle. Perfect fit and no leaks. I got a few feet of these and for a few cents a foot it was a great investment. Now I have blue tubing for my good water and red for waste water. My rodi unit only came with white tubing so this makes it unmistakable when making good my own rodi water. It cuts well with a sharp razor blade and fits perfectly into my unit. It is what it is......a 1/4 inch RO tube. I used 40 ft of this for my ATO and the true Royal Blue color is very nice. Matched the blue PVC perfectly. Great stuff. Very durable. No leaks. This stuff is quite rigid so it will try to maintain it's shape as it was wrapped around the spool, so it can be a little difficult to route it exactly where you want it, but that's to be expected. I was looking for a way to be able to reach my tanks sump without having to move my RO unit closer every time. This came in customized length and was perfect for what I needed. This tubing is extremely easy to work with and works perfectly. Even at high pressures. I mean to say when I have my gauge showing over 105 pounds of pressure the tubes have held perfectly! Also buy the cutting tool it is a must! Don't bother trying to cut it straight any other way. Just buy the tool too. P.S. To hold these tubes in place in addition to drilling holes in the wood I found that using the Coax Cable holders designed for TV type coax cable works extremely well for routing these. These are c clamps with little nail. Perfect size won't squish tubing at all and easily moved/removed with ease. Makes running them neatly a breeze. The tubing works great and is easy to route albeit a little stiff. But that's to be expected so not a huge deal. The push on connectors make installations a snap. I used this three years ago to run water lines through the hot attic of a metal building. It has held up over the winters and the hot summer heat. Easy to use, pliable but firm. Mur-Lok makes the best tubing I have tried. It's more pliable and forgiving than other brands. I also appreciate the ability to order very small quantities for color coding RO systems and for repairs. Great stuff. I just want to ask how long is the roll of this tubbing that you guys sell? Is this the right size and good for your brs dosing pumps? I also need a drain line for a pre drilled tank. Can you send me a link. Can't find it on the website. The BRS dosing pumps utlize a compression fitting that is pretty forgiving with tubing around a 1/4" but the clear RO tubing here is a popular choice for them. Would the clear tubing more prone to algae buildup than the other colors? If you have a solution that is conducive to algae growth (like aquarium water for example) then yes, the clear would be more conducive to algae growth as it lets in light. Black would be the least conducive. We need 25 feet of 1/4 inch BPA free tubing for our RO unit. When I add 25 in the order box , will we receive one continuous 25 feet of tubing? This will ship out with a single long 25' tube. Feel free to let us know if you have any further questions! On the 1/4" mur-lok tubing, is the outside diameter 3/8"? I have an Aquatec 8800 with a 3/8" inlet and outlet. Being that I live in Arkansas and it seems to be a geographical oddity, I have had troubles finding this type of tubing with an od of 3/8" with a 1/4" id. Can this tubing be used for a calcium reactor. The 1/4" tubing can work great for most calcium reactors currently available! Feel free to let us know if you have any further questions! What is the working pressure and temperature for the 1/4" tubing? Also what is the the ID size of the tube? Our tubing is designed for standard residential use up to 100 PSI recommended. The temperature should not exceed 100 degrees. The ID of our tubing is 3/16" Feel free to let us know if you have any further questions! What is the ID , wall thickness and psi of this 1/4” mur-loc ? For the 0.25 cost how many feet of tubing do you get? 1 foot? You are correct, a quantity of 1 will give you one foot of tubing. Is this Mur-lok tubing safe for CO2 use for calcium reactor? Sure is. This would be the same type of tubing (1/4" polyethylene) that many companies sell as "co2 safe" tubing. How many feet come in a roll of 1/4" r.o. Tubing? I'd like the whole roll but don't see that as an option. The tubing comes on 500 rolls.